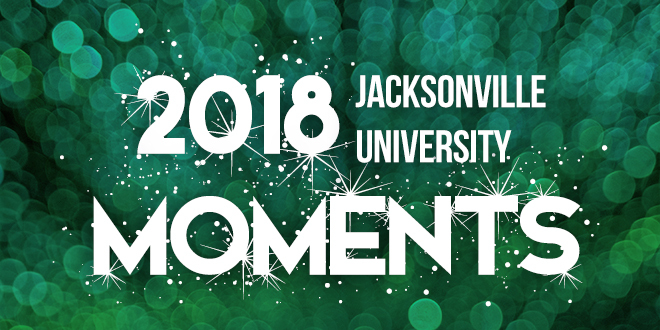 Five ASPIRE Investment Projects that Show Us the Future of Jacksonville University From its 2012 inception, the comprehensive ASPIRE Campaign set out to be the largest, boldest fundraising venture in the history of Jacksonville University. Now, six years later, that challenge has been met. Thousands of investors believed so much in this university’s work and collective potential that the contributions have now surpassed ASPIRE’s original $85 million goal by $36.4 million—and ahead of schedule, two years before the campaign’s planned closing date. Through the Lens of Progress: An Interview with President Tim Cost ’81 The amount of progress created on the Jacksonville University campus over the past five years has accrued at a rate that should leave those watching breathless about future possibilities. Cultivating a private university in a vibrant city, located in one of the fastest growing regions in the world, and during one of the most explosive periods in history, is exactly the role Jacksonville University President Tim Cost envisioned from the beginning. University Celebrates $6 Million Unrestricted Gift: The Swisher Legacy Lives On Jacksonville University is pleased to announce it has received a $6 million unrestricted gift from The Carl S. Swisher Foundation. The Swisher name is synonymous with service, support, and generosity at JU. The late Carl S. Swisher, among the University’s first major donors, has been integral to University progress since its earliest years. Jacksonville University Announces Linda Berry Stein College of Fine Arts On Fri., Dec. 7, Jacksonville University announced the naming of the Linda Berry Stein College of Fine Arts in recognition of a multi-year, multi-million-dollar gift, among the largest investments in the University’s 84-year history, from alumnus Linda Berry Stein ’69 and her husband, David Stein. Online Nursing Master’s Program Soars to New Heights on U.S. News’ “Best Online Graduate Nursing Programs” List Engaged students, responsive faculty and state-of-the-art technology have put the online Nursing masters program offered through JU’s Keigwin School of Nursing in elite company on U.S. News & World Report’s annual “Best Online Graduate Nursing Programs” list. JU Athletics Brand Unveil Pulls in Bold City Tuesday, Aug. 28, the Jacksonville University Athletics Department unveiled a fully re-imagined brand identity. The crowded event was live from Swisher Gymnasium with Senior Vice President and Athletics Director Alex Ricker-Gilbert and Sr. Vice President of Marketing and Communications Scott Bacon serving as JU’s number one brand ambassadors. JU Launches Master in Public Policy Minority Fellowship Program with City of Jacksonville A historic initiative backed by the Mayor, Jacksonville University and key black community advocates will offer future African-American leaders a two-year JU Master in Public Policy scholarship, a city internship and job placement help that keeps their vision and talent in the community to address critical regional challenges. JU CFA Team Wins National Research Challenge & Looks Forward to Global Final Judges announced JU had won the Americas Regional and would be one of five teams in the world to compete in the Global Final on April 27 in Kuala Lumpur, Malaysia. The victory serves as another building block in JU’s quest to be viewed among the elite. The Davis College of Business already has the prestigious designation of being accredited by the Association to Advance Collegiate Schools of Business, but there are other aspirations. Deep-rooted Green Efforts Gain Campus Its Third Straight Tree Campus USA Recognition Jacksonville University has gained official 2017 Tree Campus USA recognition from the Arbor Day Foundation, the third year in a row it has been singled out for its commitment to effective urban forest management. Only 344 campuses – fewer than 10 percent of all public and private U.S. colleges – meet the requirements for the recognition. Just 15 campuses have the designation in Florida, and only a few of those are private universities.